Please note that a supported hardware device is required to unlock the feature set of Cubasis LE (unless unlocked Cubasis LE runs in demo mode). Please visit http://www.steinberg.net/cubasisle for more details. 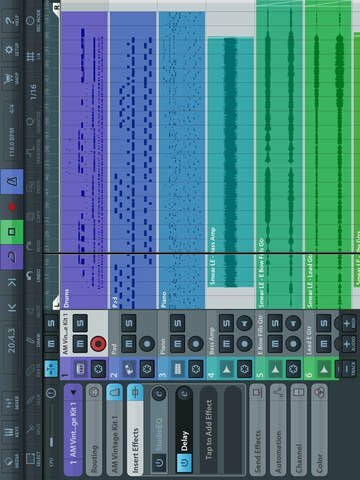 Cubasis LE is the compact version of Steinbergâ€™s streamlined, multitouch sequencer for the iPad, providing the same look and feel of its bigger brother Cubasis. Specially designed for quick and easy operation, Cubasis LE makes recording, editing and mixing a breeze. With MicroSonic, Cubasis LE includes a virtual instrument to be played in real-time using the flexible virtual keyboard. Song ideas can be captured with up to four audio and four MIDI tracks and further edited and polished to perfection with the integrated editors, mixer and selected effects. Thanks to the Cubasis project importer, Cubasis LE projects can be even opened in Cubase â€” both on Windows and OS X. With touch-intuitive production tools, Cubasis LE opens up a new world of possibilities for your creativity. User registration required to unlock RoomWorks SE reverb effect. Audio Unit extension (in-app purchase) requires iPad Mini 2, iPad 4 or later models. Audio Unit (in-app purchase) and Waves plug-in (in-app purchase) automation requires iOS 10 or higher. Audio Unit MIDI and Files app require iOS 11 or higher.